"The rag-tag followers that trail after an Orc & Goblin army are vile, destitute and quarrelsome beyond even the disgustingly low standards set by Orc warriors. Heavy and multiple-dugged Orc womenfolk make up the majority of the baggage train. Their mewling off-spring, the aged, whelps and assorted hangers-on make up the rest." "Those too infirm, old or stupid to be drafted into the army can make a good living by 'workin' the baggage'. Drivers, leather workers, smiths, bunko-artists, and all manner of worthless scum can profit by hanging round the army. Taking advantage of the confusion, they loot pillage, burn and steal along with the rest of the army as well as sharing in the fun (torturing captives) and spoils (eating captives)." 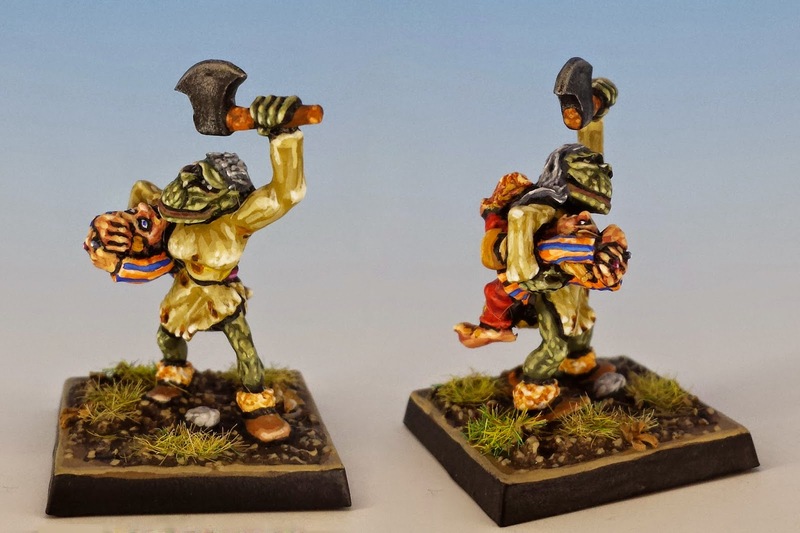 Thus reads one of my favourite passages of writing in the entire body of Warhammer literature: the description of Orc & Goblin baggage trains contained in Warhammer Armies (1988) by Nigel Stillman. It embodies perfectly the colourful, grotesque and wry world of classic Warhammer. As I've written before, I think a fantasy army is incomplete without a proper baggage train -- there's no better way to give your force its own unique personality. Certainly, my hapless and profoundly inebriated orc army, Krapfang's Backwood Bandits, deserved a suitably sordid group of camp followers. I wanted to give them a carnivaleque feel... one part Bruegel the Elder and one part Monty Python and the Holy Grail. An orc army is spoiled for choice. 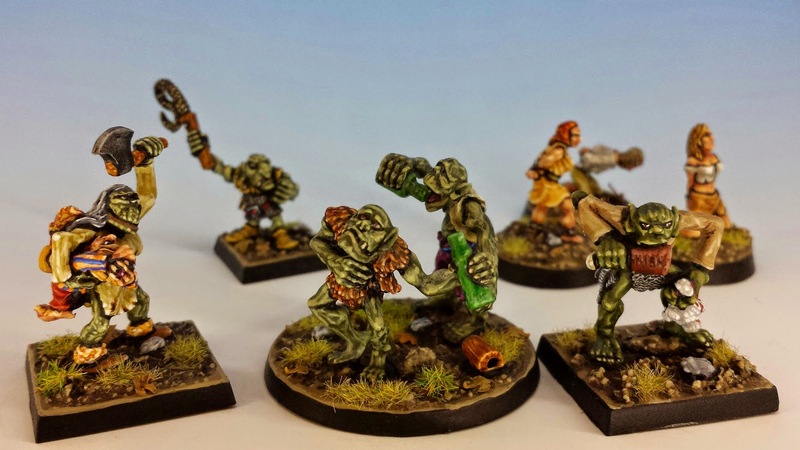 The starting place is the range of Orc Villagers (C46) released by Citadel in 1988. Trish Morrison (now Trish Carden) is sometimes maligned -- and Crom knows, I've never loved her work for Marauder. But these Orc Villagers are the bees knees. They are especially gangly and awkward sculpts, even for orcs of the Kev Adams era. For Krapfang's army, I was immediately drawn to the blind drunk orcs, which I put together in a mini-diorama. I also wanted some looters, so I chose a male orc stealing a ham and a female orc stealing a halfling (it's the other white meat). 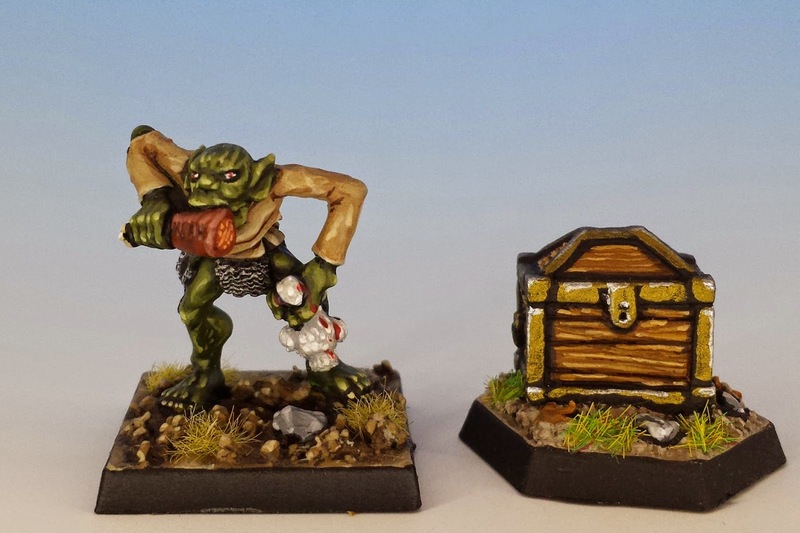 I rounded out the booty with one of the rare miniatures sculpted by game designer Rick Priestly -- a strong box from the C39 range of Treasure Chests. Who knew RP could sculpt very tiny furniture? The man's talents never cease to amaze. But I wanted something special for the centerpiece of the baggage train. And that's when I hit on the idea of putting together a pathetic gang of human captives that the orcs are getting ready to sell for beer money. The slaves' presence would lend Krapfang a much needed air of cruelty -- and they can also function as a nice objective for any opposing army. The slave-master was an easy choice: a Goblin charioteer (from Marauder MM33), wielding a highly motivating whip. But finding the slaves was a harder matter - eventually I settled for some non-Citadel miniatures to fit the bill... some lovely sculpts from Iron Wind Metals. Thrown together, I think they make a fairly unsavory tribe. The little touches in the sculptures are what I love the most: how the captured halfling is wagging his little legs, or way the eating orc wraps his lips around the leg of ham, like an octopus absorbing his prey. Now, won't someone come and rescue those slaves? It took me months to find those captives (I got them a couple years ago) -- and then when I went to write this post, I couldn't remember where I got them from. Well, I managed to find an old receipt, and it turns out they're from Iron Wind metals. I'm going to edit the post to reflect this and put in a link. Thanks for prompting me to do so. Good to know.I like Iron Wind metals. I was planning on buying their chaos warrior sculpts. Great, really chaotic and characterful - I bet they set off nicely against the army itself. That tears it! I have to make my baggage element for Oldhammer USA weekend. I may even have to steal the charioteer idea. A great way to both personalise your force and provide models for special scenarios. Thanks guys! It always fun showing you guys me stuff. I'm hoping that I'll be able to get down to the States for the Oldhammer USA weekend, and then we can gawk at each other's miniatures in the flesh (or lead, as the case may be). Great stuff sully, as usual. I love the comedic aspect and the Python tie ins but if I may darth Sullivan you may have forgotten the most important part of an Orc baggage train.... The escapees!!! 'multiple-dugged' ... there's an image that's hard to shake! Excellent work, I'm busy on my own Chaos baggage at the moment and you've given me some fine inspiration. I'm looking forward to seeing the results, W.P. - the sky is really the limit with a Chaos baggage. I think it involves a lot of spare coconut oil for the daemonettes. And dog biscuits for the Beasts of Nurgle. I think a Chaos baggage train demands a Chaos Toilet! Very cool! One can almost hear and smell their carrying-on, Matthew! And my Dwarves somehow feel honour-bound to rescue those poor hapless slaves! You and 24_Cigarettes can come an git 'em.